The cold spell has finally broken, we are celebrating the freedom to walk about leisurely without fear of frostbite with a night on the town in Ann Arbor. 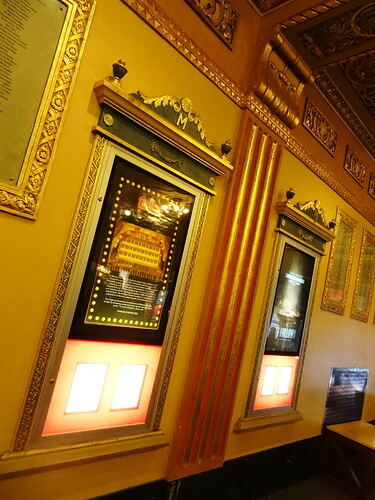 The Michigan Theater is mid-way through their Noir Film Series, playing tonight is The Lady From Shanghai, the 1947 film starring Orson Welles and Rita Hayworth. First things first, on-street parking is non-existent on this balmy March night, fortunately there’s a parking structure just around the corner from the theater. With the Jeep neatly parked for the next several hours we head to the Slurping Turtle for some dinner. 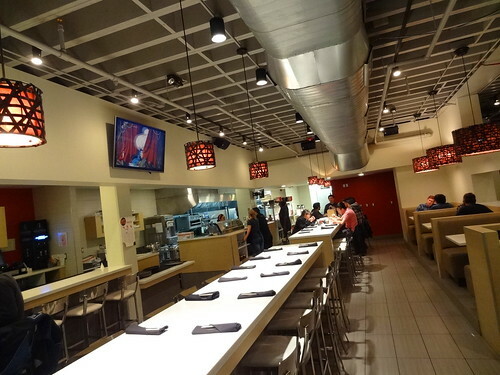 Renowned Chef Takashi Yagihashi opened his second Slurping Turtle restaurant right here in Ann Arbor nearly a year ago. You may recognize his name from such shows as Iron Chef and Top Chef Masters. 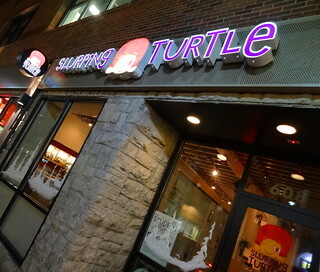 Yagihashi has successful restaurants in Chicago, including the original Slurping Turtle. He has close ties with Michigan; he operated Tribute in Farmington Hills from 1996 until 2005, in 2003 the James Beard Foundation named him “Best Chef Midwest”. It was those ties and two children in Michigan colleges that brought him back to the mitten. 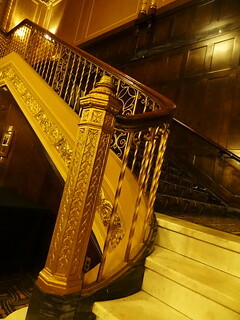 The Ann Arbor location is on the main floor of the old Borders building on Liberty Street. The dining room has a bright, clean look to it, matching pendant lights hang above communal tables, there is an open kitchen, counter seating and a few booths. Our server greets us quickly, delivers menus and takes our drink order. There’s a wonderful selection of authentic Japanese Ramen (noodles are made in house), sushi, street food and comfort food. Not really in the mood to Slurp, we choose 4 dishes to share. First out are the Hamachi Tacos: tartare of yellowtail, truffle soy and a taro root shell, really good and a nice starter. 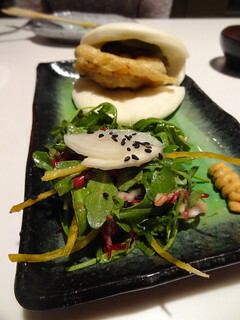 The vegetarian Bao is out next, I’m crazy about these steamed bao buns, this one has a tempura mushroom along with other goodies tucked inside, served alongside a tasty little salad; we’d both get this again. 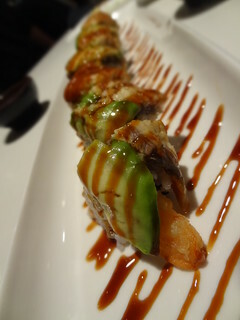 The Dragon Roll arrives looking quite tasty; shrimp, bbq eel, avocado, sauce, delicious. 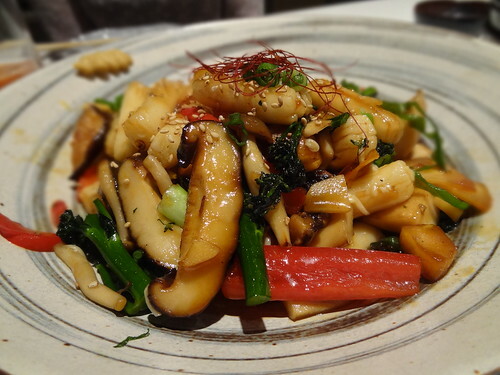 Our favorite dish is the Kinoko Mochi; plump tube-shaped rice cakes, a medley of Japanese mushrooms, boccolini, parsnip, sweet bell peppers and Parmesan in a chili soy sauce, fantastic! Outside, we cross Liberty and are standing in front of the Michigan Theater, opened January 5, 1928, the marquee looks just as it did then. 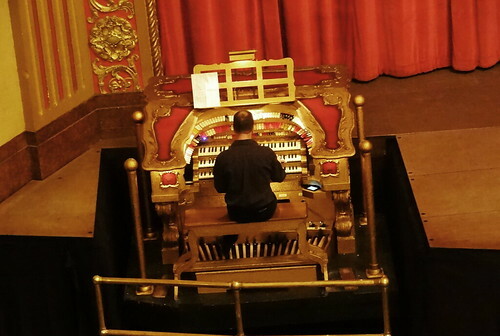 When the theater originally opened vaudeville and silent films were the regular fare, shows were accompanied by live music from the Barton Theatre Organ which is still in place. 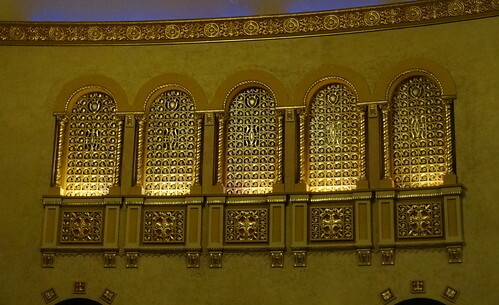 During the 30’s and 40’s the theater thrived, movies drew a big crowd, there were also live stage shows and University of Michigan events. 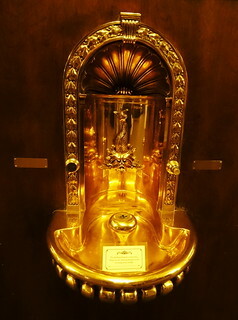 Television came along in the 50’s, film audiences declined as more and more people got their entertainment right in their living room from their TV set. 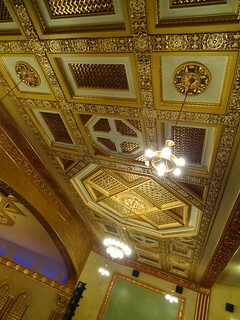 In an effort to draw folks back, the Michigan was modernized in 1956; plasterwork was covered with aluminum, polished marble and a false ceiling. 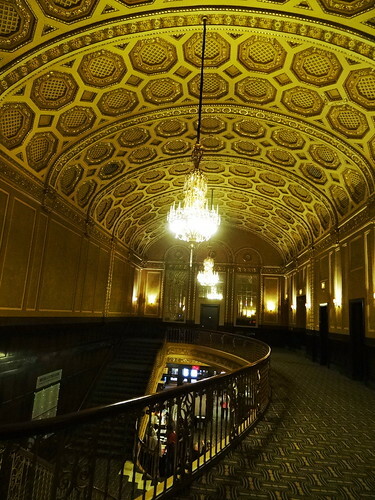 The theater stopped operating in 1979 and the building’s future was “uncertain”. 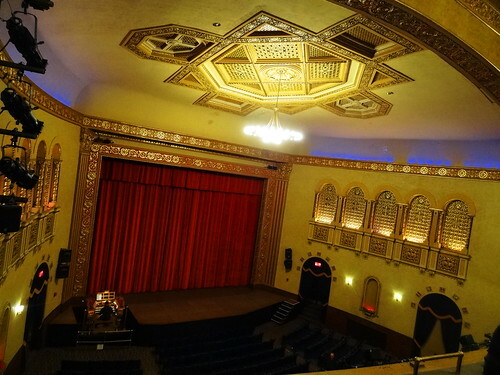 Sadly, the Michigan Theater’s story is not unique. 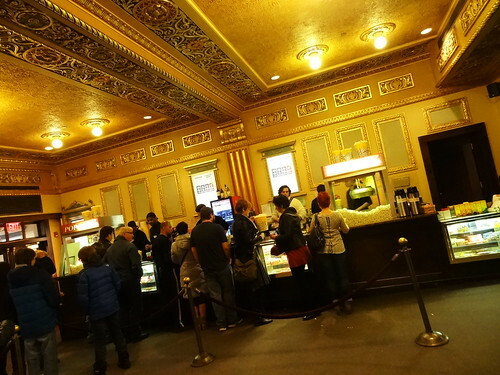 We purchase our tickets at the ticket window under the flashing marquee, inside, the aroma of fresh-popped popcorn fills the air. 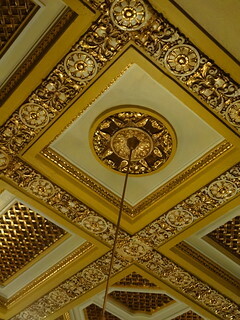 With a small popcorn drizzled with melted butter in hand I follow Kris into the Grand Foyer; grand it is! 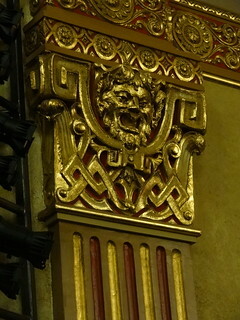 The entire theater is decorated in ivory and gold, here the ceiling is coffered, raised designs sparkle in gold leaf, a dramatic staircase leads to the balcony level, crystals dangle from elaborate chandeliers, a drinking fountain built into the wall is exquisite, the lower portion of the walls are beautiful dark wood panels. 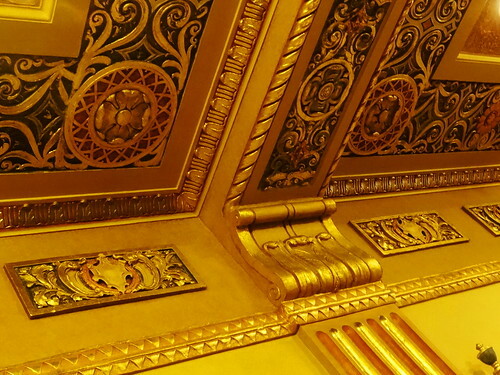 From the balcony we have a panoramic view of the auditorium; a red curtain hangs above the stage, the organ is being expertly played, gold leaf geometric patterns decorate the ceiling, a series of arches covered in lovely gold grates flank the side walls. 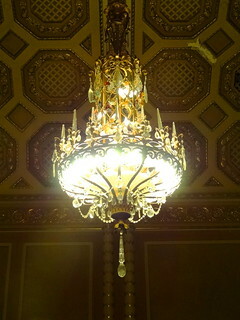 Circular chandeliers with exposed round bulbs light the large space, ornate plaster moldings surround the walls. 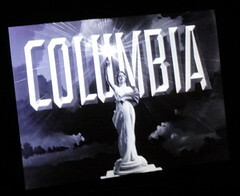 There’s nothing like watching a film on the big screen, especially an old film, this one is black and white. Orson Welles and Rita Hayworth were married when this film was made, her long red hair cut short and dyed blonde for the role, she’s stunning as always. In true noir form, the story has its twists and turns creating suspense and tension, leaving us uncertain ‘who done it’ right up until the end. 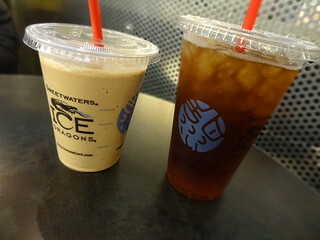 Back across Liberty Street we stop in at Sweetwaters Coffee and Tea for a little post movie chill before driving home. 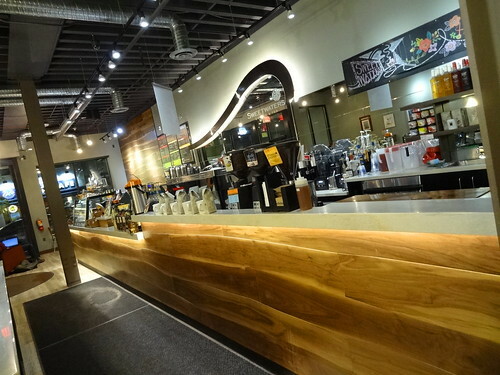 This is the first time we’ve been at this location, it’s quite attractive inside; narrow wood panels are mounted to the walls horizontally, a large mirror behind the counter gives the space a big, open feel, toward the rear, a partial wall is covered in lush green plants. 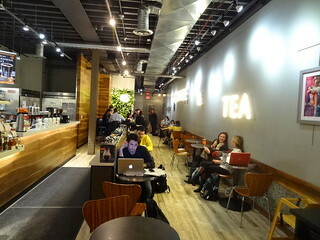 Serving coffee, tea, blended frozen drinks, pastries and light food, there’s something for everyone. Kris gets a cold brew and I go with my longtime favorite, coco cafe. Vanilla ice cream, chocolate syrup and espresso blended together until smooth, it’s the perfect sweet ending to a wonderful night.